When it comes to epic fall road trips, Washingtonians have it easy. We live in a state that is chock-full with some of the nation’s most well-known scenic drives. We would be fools not to take advantage of the beauty that awaits our discovery in our own backyards, and what better way to enjoy them than with our trusty four-legged sidekicks along for the ride? I especially like to turn to road trips for adventures in the fall when rain is dumping from the sky in buckets. Hiking is no fun when it’s really wet out. In the car we can stay dry while checking out vibrant beauty Washington State has to offer. It’s a bonus when we do catch a break in the rain and can check out some of the points of interest along the way. Below are some of my favorite driving routes. If you didn’t already appreciate the vibrancy of fall, this route will ensure that you do. The legendary Cascade Loop begins in Everett, not far from our home-base of Seattle, and stretches a grand total of 440 miles. The beautiful thing about this monstrous loop is that it can be enjoyed in one adventurous day, completed in a weekend, or, if you love stopping at every hub and pull-off in site, stretched over the course of two weeks. While passing through some of Washington’s most beautiful get-away destinations, there’s enough to see and do along the way to keep you more than occupied for the entirety of the trip. You can expect to see golden larch and tamarack, red-vine maples, and orange hardwoods while weaving through the variety of terrains you’re bound to hit. These unforgettable views await your viewing pleasure around every corner, whether you’re just driving through, or enjoying the innumerable amount of hikes that await your discovery along the way. There are 9 distinct regions along the way, stretching from Skagit to Wenatchee. You start the drive by heading north from Seattle to Everett. Taking the drive counter clockwise, you’ll head over the Cascade mountains on Highway 2. In Wenatchee, you head north on Highway 97 and then 153 to Winthrop. From there you head east back over the Cascades along highway 20. You’ll take it all of the way to Whidbey Island then head to the town of Clinton on the sough end of the island. Here you will cross a ferry and take Highway 525 back to Everett, completing the loop. Perhaps one of the most notable and well known regions of the route is the North Cascades Highway. If you find yourself in this area, I highly recommend taking the time to visit Diablo Lake. A 7.6 mile hike roundtrip that welcomes pups of all shapes and sizes, the awe-inspiring view of the aquamarine Diablo Lake is one that you just can’t afford to miss out on. Other dog-friendly points of interest along the Cascade Loop drive are the 2-mile Rainy Lake Trail along the North Cascades highway, the Rolling Huts in Winthrop (lodging), Peshastin Pinnacles west of Wenatchee, the little Barvarian town of Leavenworth, the Deception Falls National Recreation Area just west of Stevens Pass Ski Resport, and the Wallace Falls hike in Gold Bar. Notes: The North Cascades Highway is closed during winter, generally from November (the fall colors are usually gone by then anyway) through April or May. Be sure to check the road status before you go. ; You can combine this route with the Lake Wenatchee Loop route below for an even longer trip. Not only is it a beautiful drive along the coast, but it also has the best name. Chuckanut Drive. It’s very satisfying to say. Try it. This drive is Washington’s quaint version of Big Sur along the California coast. While less dramatic in height, this 21 mile drive is no less grand as you weave along the rocky shoreline of the Puget Sound, a golden and red maple forest on one side, and a view of the forested San Juan Islands on the other. This winding (and narrow) road runs north from Burlington to Bellingham, and is known for its outstanding sunsets, migratory birds, and sequestered beaches. Dog Friendly highlights of this drive include the Oyster Dome trail along Chuckanut Drive, tide pools that are teeming with life at Larrabee State Park, fossil viewing along the route (although you may want to leave your dog in the car for this one due to the narrow road shoulder), and the famous Fairhaven Fish and Chips. Let me be frank: if it’s autumn and you want insane views, Leavenworth must be seen! If you’re a sucker for a cozy German town and all of the breathtaking views surrounding it, driving the approximately 50-mile Wenatchee Loop may be just what you need in your life. You can expect to see blazing yellow and red maples set against dark green pines and rugged mountain silhouettes that make this area so magical. For starters, you’ll head out through Leavenworth along Highway 2 through the Tumwater Canyon. You’ll be awed by jagged peaks, tumbling rapids and, if you are there during or after a heavy rain, waterfalls cascading off of the cliffs. When you reach Highway 207 at the Cole’s Corner gas station, you’ll turn north toward Lake Wenatchee and continue around the lake to the furthest northern point. Here you have two options. If you have a 4-wheel drive vehicle and a map, and the road is not closed due to snow or water damage, you can continue along the Little Wenatchee River Road to Forest Service Road 6700/Smithbrook Road. This road eventually reconnects with Highway 2 just east of Steven’s Pass. You can then take Highway 2 east back to the Tumwater Canyon and Leavenworth. The other option is to turn around at the north end of Lake Wenatchee. You will return south along the road you drove in on and eventually turn west along Highway 209. You’ll drive through the tiny town of Plain, up and over the windy Chumstick Highway, and land back in Leavenworth. No mater which way you choose to go, the views are spectacular. 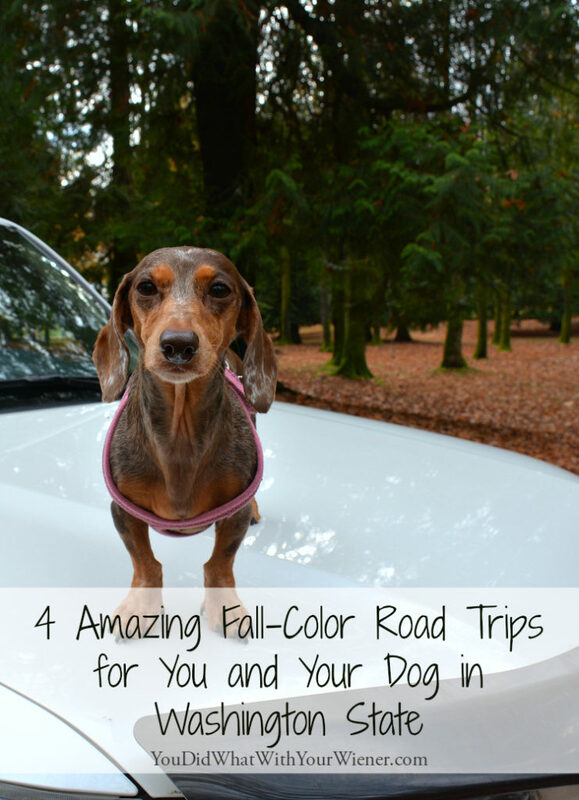 Dog-friendly points of interest along this driving route are the Icicle Road (a beautiful out-and back road to extend your fall viewing pleasure) at the west end of Leavenworth, the 2.4 mile Pipeline Trail in Tumwater Canyon, and the Munchen Haus Barvarian Grill in Leavenworth. The Quinault Rainforest is located in the Olympic National Rainforest, North America’s only temperate rainforest, and is known as the Valley of the Rain Forest Giants. If you’re mesmerized by giant trees, this area of Washington is home to some of Mother Nature’s most impressive displays, including the world’s largest Cedar and Sitka Spruce. Pretty awesome that Washington is home to two of the world’s largest trees, and I recommend everyone take the time to check them out! This drive will make you feel like you took a step back in time to Prehistoric ages due to all of the moss and ferns, which are simultaneously mixed in with yellow and red deciduous trees that are telling of a winter to come. The Lake Quinalt Loop is 31 miles roundtrip, and offers views of the lake and waterfalls while also getting you in close proximity to prime elk and eagle habitat. In general, the Olympic Rainforest is not dog friendly because it’s inside of a National Park but, lucky for us, the south shore Quinalt road lies in the Colonial Bob Wilderness of the Olympic National Forest which does allow dogs. This drive is for the more adventurous as half of the loop is along unpaved roads not suitable for RVs and Trailers. The closest major town to where this loop begins is Aberdeen Washington, about 2.5 hours from Seattle. From Aberdeen you will head north along Highway 101. In about 44 miles you will reach the turnoff for the south shore Quinault road. You can turn here to complete the 31-mile loop counter clockwise or pass the turnoff and take the one for the north shore Quinault road. Either way you will cross the Upper Quinault River Bridge and return on the road you didn’t take to get there. Dog friendly points of interest include the historic Lake Quinault Lodge (dog-friendly accommodation built in 1926), the 1/2-mile Rainforest Loop Interpretive Trail, and Merriman Falls (visible from the south shore road). If you’re a sucker for warm autumn colors and you and your dog are itching for a fall-time adventure, take an evening, weekend, or the entire week for yourself and enjoy Washington’s natural beauty. Every year the fall seems to come and go in the blink of an eye, so pack your bags and hit the road while the leaves are still on display. Have you seen any other places in Washington State that are spectacular in fall? All of these drives sounds absolutely lovely, and I bet my pups will love seeing the fall colors in all their glory. I will have to make a plan to get to Washington soon!